With General Motors simultaneously releasing two new compact SUV's to the market under the Buick and Chevrolet brands, we hope this post will answer some of the most frequently asked questions pertaining to the differences between the Buick Encore and the Chevrolet Trax. On the surface the 2015 Buick Encore and 2015 Chevrolet Trax are incredibly similar vehicles. They both share the same compact Gamma II platform that General Motors also utilizes in their overseas vehicles including the Opel Mokka. The Trax measures 167.2 inches long and 70.0 inches wide and has a wheelbase of 100.6 inches. With a trademark bow-tie logo located prominently front and rear and mini-Traverse styling, there’s no mistaking it for anything but a Chevrolet. The Encore holds a microscopic gain over the Trax with an overall length of 168.4 inches and growth in width to just 71.5 inches. Sharing the same platform, both vehicles maintain the same wheelbase of 100.6 inches. Available in both 6 speed manual and automatic transmissions the Trax and Encore will come equipped with GM's fuel efficient flagship motor; the 1.4L tubo producing 138 hp and 148 lb-ft of torque. This inline four will power its way to excellent fuel economy delivering fuel consumption ratings. The Trax and Encore are also available with an active AWD system. Drivers have the peace of mind knowing that whether they are behind the wheel of the Buick or Chevrolet, they are protected by 10 standard airbags and electronic stability control, hill start assist available on all trim levels. While both vehicles are incredibly similar, the Chevrolet Trax has a few tricks up its sleeve that powers it ahead of the Encore while carrying an MSRP significantly less than that of its Buick brother. The Trax comes with an available Chevrolet MyLink system featuring a 7 inch colour TOUCH screen and infotainment system. Due to the placement of the infotainment system in the Encore, you CAN'T get an Encore with a touch screen interface. The Trax is available for purchase starting under $20,000. A fully equipped Trax with MyLink and a sunroof, compared to an Encore with equal options will save you more than $5,500. 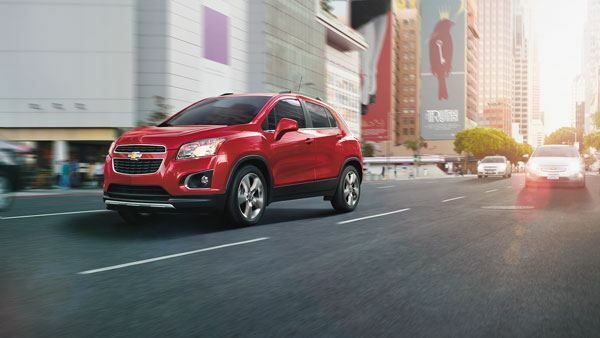 Enjoy lower monthly payments in your Trax. Storage amenities in the Trax is a plus, with 4 cup holders between the front seats, (8 in total) which comes in handy for those doing traveling and commuting with growing families. Trax is assembled in North America. Those concerned with domestic manufacturing can take pride in their all new Chevrolet. The Buick Encore is assembled in South Korea.